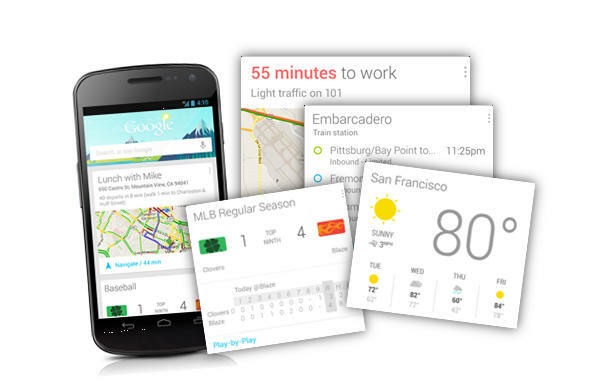 Google Now, the Siri-like assistant app on Android 4.1 Jelly Bean devices, could be in store for one sweet update in the coming weeks. At least, that’s what Google’s leaked support documentation suggest. According to the documentation, we might see widget support come to the powerful card technology in the coming weeks. Google Now allows users of the assistant service to not only ask how far away the moon is, but also keep up to date on important info through the usage of its innovative card system. The Google Now card system shows off a variety of relevant tidbits of information to you as you run along with your day, giving you a quick update on anything from traffic, to weather, to restaurant reservations. Two of the biggest limitations in the Google Now card service are the fact you can’t make your own cards, and that you can only view them from the Google search prompt. While we’ve yet to hear on the former, Google apparently let the widget cat out of the bag in some new support documentation, which the folks at AndroidCentral caught wind of. The documentation in question has since been edited to remove the widget references, but people are already getting excited about the potential of widgets. Google Now has been a bit of a sleeper for Google, as the company has been slow to truly bring out the potential its service has for users. Like Siri, Google Now has the ability to answer questions, pull searches, and serve as your very own assistant, but Google Now also has the unique “Cards” feature that has, for the most part, only begun to show its abilities. A recent ad during the Grammys on Sunday showed just a few of these feature. Google Now has yet to have an API released for it either, meaning that developers can’t yet make their own unique cards for the service. Should Google ever let the devs get their hands on Google Now, they’re sure to show off what they would do with the powerful technology. Either way, if widgets really are in the future as an OS or app update, then there’s much to be excited about as Google continues to advance its innovative technology.